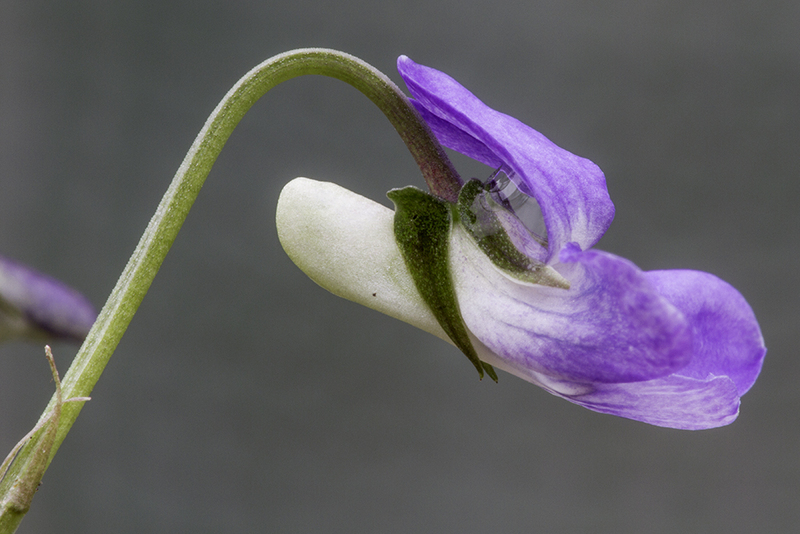 This attractive little native is one of three species of violet commonly encountered in woodlands. Starting in February the earliest to flower is sweet violet (see previous page) which can be distinguished from the others by it is scented and its blunt sepals. Next, in early March, comes the early dog-violet (not available from us at present) and then in early April this species the common dog-violet. The two dog-violets can most easily be told apart by the colour of the spur behind the flower. 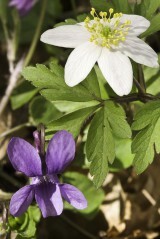 In early dog-violet the spur is darker than the petals whilst in this species it is paler. Common dog-violet Viola riviniana is a native perennial of deciduous woodland, hedges and other shaded. It can be found on a wide range of soil types but is most frequent on calcareous soils over limestone and chalk or base-rich clays. As with the previous species ants help to spread the seed. They are attracted to a fleshy structure on the seed known as an elaiosome and can carry them for some distance before losing interest and dropping them. Sow in the autumn as the seed may require a period of chilling to break dormancy.